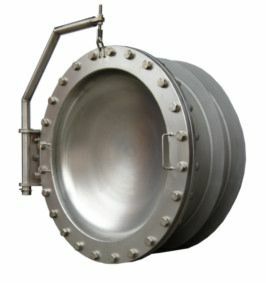 Hatches for non-pressure, pressurized chambers and tanks. Municipal applications for pump stations, lift stations and chamber entry. Available in Stainless 304L, 316L, steel and galvanized steel materials. All sizes available. For highly visible hatch locations, 316L stainless materials may be a polished finish. Hatch Covers: may be square, rectangular or round, available seals are EDPM seals, neoprene or other rubber seal types. Covers may be insulated to customer requirements. Safety features include guards against accidental door closing. Opening assist leverage, grating covers and locking features are also part of the WA-WR-K manway doors. 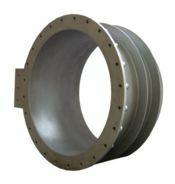 Watertight, stainless steel, open safe arm, seals EDPM rubber, NBR rubber or special requirements. 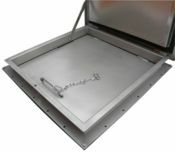 Access covers WA-WR-K models are mounted in the upper part of the chamber for entry to inside components. Locking devices, grating and spring assist opening can be part of the hatch cover build. Pump Stations, Wet Wells, Valve Chambers, Lift Stations, Equipment Chambers. 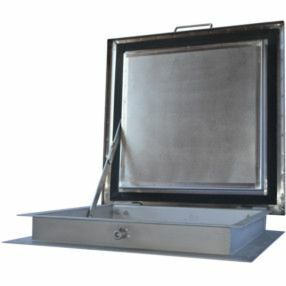 Manway Hatches: Steel - Stainless steel: WA.WR-K round. Manway access for non-pressure, pressure, tank and chamber entrys. Available in Stainless 304L, 316L, steel and galvanized steel. Manways and hatches with EDPM - NBR cover seals. Security Locking. Waterproof, Insulated cover. 600 -1200 mm manhole hatch covers. Hatch covers bolt to concrete opening, angular designs, round cover designs and split cover designs are available. 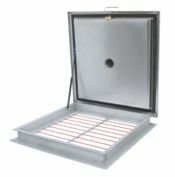 Manway hatch covers have a waterproof seal gasket on the doors - easy access to chamber vaults. Manway Hatch Covers for pressurized tank entry. Diameters from DN600 to DN1200 / 24 Inch to 48 inch. 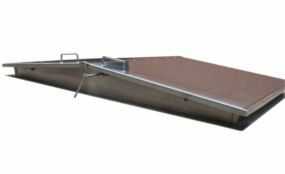 Hatch cover assembly includes the cast in sleeve with puddle flange collar on the sleeve and a bolted closing pressure cover. Hatch cover flap doors are suspended on an adjustable arm, enabling a smooth opening/closing for maintenance crews. Manway access hatches are installed in concrete tank walls for inspection access, maintenance and repair. 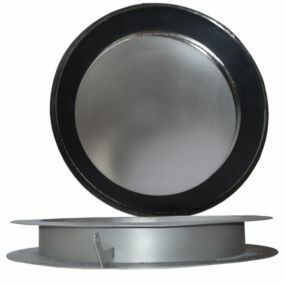 Manway hatches are available for flange mounting on steel tanks with the same basic design. manway hatch covers, hatch covers, hatch covers stainless steel, hatch covers pressurized tanks, pump chambers, lift stations, valve chambers, wet wells, underground access, basement entry covers, seals, lock, security, hydraulic opening, easy access. . USA and Canada, USA: Texas, TX, Houston, New York, NY, Illinois, IL, North Dakota, ND, Iowa, IA, Ohio, OH, Michigan, New York, NY, Utah, Arkansas, Kentucky, KC, California, CA, Colorado, Denver, Louisiana, LA, Florida, FL., Pennsylvania, PA. Wisconsin, WI. Canada: Ontario, Oakville, Toronto, London, Hamilton, Mississauga. Alberta, AB; Edmonton, Fort McMurray Calgary, Medicine Hat, Grande Prairie. Fort St. John, Estevan, Brooks, Blackfalds, Swift Current. British Colombia, BC; Kelowna, Vancouver, Prince Rupert, Kitimat. Saskatchewan, SK; Regina, Saskatoon, Prince Albert, Estevan, Swift Current. Manitoba MB; Winnipeg, Thompson. Quebec, QC; Montreal, Quebec City, Trois-Rieviers, Chebougamau, Sherbrooke. QC, Alberta, Saskatchewan, Manitoba, Quebec, New Brunswick, NS, Newfoundland, NL.